because youre my friend. isnt he cute when he was little and scrawny. Wallpaper and background images in the Helden des Olymp club tagged: annabeth percy jackson. They look so young!!!!!!! Like the age of twelve......Wait! They are twelve! hahahaha!!!! I miss those days!!! i love the look of percy in this pic, especially his hair! 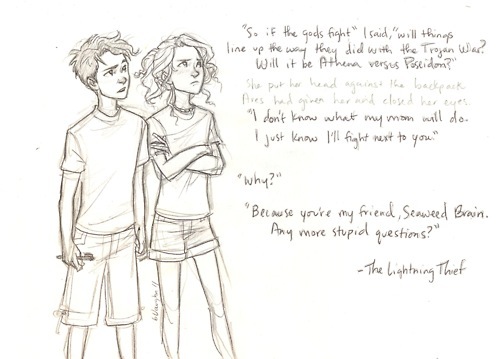 OMG I didn't know 12 year old Percy and Annabeth was so cute! i love burdge-bug! she finally makes the young ones! AWW THEY'RE SOO CUTE! I LIKE THAT PIC IT SOO GOOD! Though I never knew 12 year olds looked that young....I'm 13 and don't look close even though. I see them more like 8...though I still love it! I love how Percy has that awesome confused look haha I wish I could meet him so badly they r so cute together!!! I just love how Percy looks. And Annabeth. Wow, what a cute couple! They look so young and so cute. I think I just mentally squealed. I don't squeal. Anyway I really love this picture. (really should be commenting Burde-bug on DD not here.) but I just love the expression on Annabeth's face and the crossed arms complete the look. Percy has just the right amount of curiousness and seriousness mixed in. I also really like how he's clutching the pen even though he didn't really like his dad at the time. The part where both of them are staring at the words is genious if I do say so myself. This is a really great picture. Many, many more stupid questions. omg they look exactly how i thought they would at that age! i mean it SERIOUSLY!